One entry per contestant. Doll must be Barbie or any fashion doll produced by Mattel 1/6 scale. The doll must be repainted, hair styled and dressed by the contestant. Of the three categories, one may be excluded. Either repainted or hair styled. If at least two of the three categories are not met, the doll will be disqualified. Take a picture of your Barbie doll (or any fashion doll produced by Mattel) dressed in the fashion from the 50-60s in an environment that captures its essence. * The creations must be unique for this event not having participated in any other contests with them and they must never have been previously shared on social media. The resolution of the photo sent must be good enough to print it in A4 format. * Entries must be unique and done specially for the contest, never used for any other contest or published on social nets or websites. * People willing to enter the contest not attending to convention can mail their entries as they will be showed at convention. Send your entries to the following address: Coleccionistas de Fashion doll en Madrid, Av. De los Rosales 119, 1 D , 28935, Móstoles , Madrid. 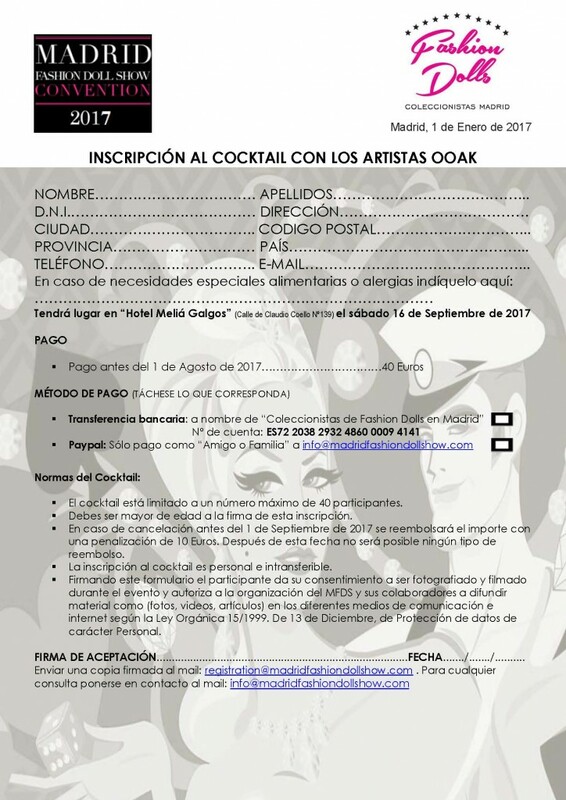 To get entries back you have to send shipping fees by paypal to info@madridfashiondollshow.com. * Every contest will have one jury prize, if the competition winner were someone not attending to convention the prize will be sent as we return your entrie. * Diorama entries sent by mail must include a diorama photography and fitting instructions. To get entries back you have to send shipping fees by Paypal to our convention account.